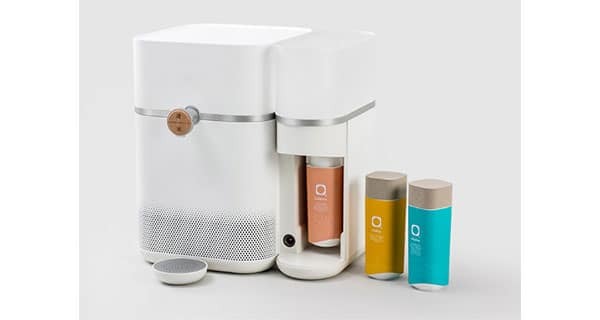 With the war on single-use plastic raging, there’s growing interest in alternative water systems – to wit PepsiCo’s recent purchase of SodaStream – and now comes news of Mitte, a German startup with a ‘first of its kind’ smart home water system. Mitte, based in Berlin and founded in June 2016, has created a system that turns plain tap water into mineralised water at home. Its smart home water system does this by purifying water with a proprietary distillation-based method, and enhancing the water with essential minerals. Water can be an essential source of minerals for the human body, and many minerals have higher bioavailability in water than in food, such as calcium and magnesium. However, other water purification systems remove important healthy minerals in water along with the contaminants, creating water that’s only pure, but not healthy. Mitte solves this problem by using mineral cartridges to replicate the process that occurs in nature when water flows through rocks, picking up minerals along the way. This unique process adds back all the minerals and trace elements that other water purifiers remove, giving you water that’s not just clean, but also healthy. The brand says it wants to respond to growing concerns about plain tap water quality around the world; and its mineral cartridges are designed to replicate the mineralisation process of natural and pure water flows. It also allows users to personalise their daily drinking water with different cartridges with varying levels of natural minerals, as well as offering an alternative to plastic bottles. Last week PepsiCo announced it would acquire Israel-based SodaStream,​​ another brand seeking to transform tap water in the home and tackle plastic bottle waste. Latest news is that the company has secured $10.6m in financing, in a round led by Danone Manifesto Ventures, VisVires New Protein Capital and Kärcher New Venture. Danone is the #2 producer of packaged waters by volume worldwide, with its portfolio including evian, Font Vella and Volvic. Despite Danone’s firm position in packaged water, Laurent Marcel, MD of Danone Manifesto Ventures, says Mitte offers a ‘strong strategic fit’ as it aligns with its goal of health through hydration. Instead of viewing Mitte as a competitor he calls Mitte a ‘complementary solution’​ that will contribute to the overall growth of the water category. For Mitte, the partnership made sense for a number of reasons: “Danone Manifesto Ventures has​ significant expertise with premium water brands globally, is aligned with Mitte’s core values, and ​is focused on a business sustainability agenda,” ​the company told this publication. The financing round will support Mitte’s expansion plans, notably in the US where it ran a successful crowdfunding campaign in 2017 (the campaign was overfunded by 360%). Matthieu Vermersch, founder and partner of VisVires New Protein Capital, an Asian venture fund which is also investing in Mitte as part of the financing round, sees particular promise for the technology in Asia. “Mitte offers a highly sustainable alternative to the burgeoning issue of plastic pollution, a phenomenon faced globally but notably in Asia where concerns over safe drinking water have been traditionally addressed via the purchase and consumption of bottled water,” ​he said. Mitte: Create your own mineral water, just like nature from mitte on Vimeo.